A miniature carving honoring Charles Birch of Willis Wharf, Virginia. He was a fisherman-waterman-gunner-boat builder-interior carpenter, and finally decoy carver in the early 1920's. 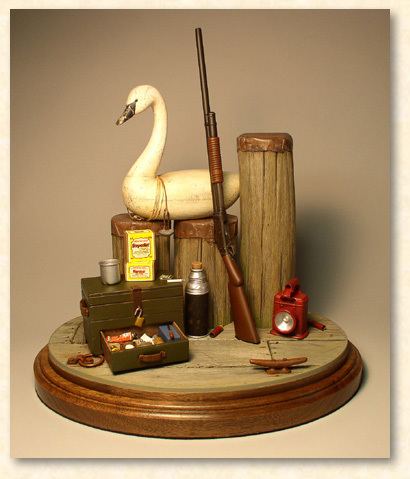 The carving features one of his fine swan decoys and is hollow carved, shaped and distressed to be an authentic miniature replica. The decoy and model 1897 Winchester pump shotgun are not fastened to the main composition and may be picked up and enjoyed as a separate carving. The setting is at the edge of an old pier as can be noted by the pilings and wooden decking. 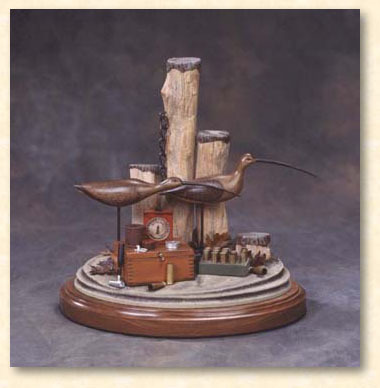 This carving was made in response to an invitation to display carvings, bronze sculpture, and crow calls at the 110th "Welcome Back to Congress" Congressional Sportsmen's Foundation-Caucus reception on Capitol Hill in Washington, D.C. Allen was honored by this sole-artist invitation. The reception was held February 13, 2007 in the Rayburn House Office Building on Independence Avenue across the street from the U.S. Capital Building. About 100-125 individuals attended including 30 Congressmen and Senators. Others attendees included leaders in outdoor, conservation, shooting sports, and hunting and fishing industry leaders. 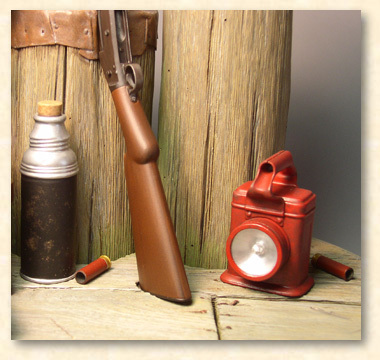 Close-up of a period-correct Masterlight electric lantern and cork stopper thermos. The electric lantern was made by Masterlight, circa 1930, and is a nice historically correct miniature example of an early battery powered light. The internet has proven time and again a very valuable resource for reference when it comes to items like this. To have a completed accurate representation, you need good reference. Winchester model 1897 hammer pump shotgun. The miniature gun is detailed right down to each and every screw. The gun is separate and may be removed from the main setting for closer inspection and enjoyment. The carving of the gun alone represents about a full week's work to carve and paint. Authentic painting and patina add the final touches. 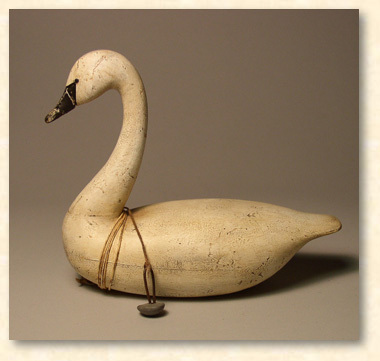 Close-up of the miniature reproduction Charles Birch 1920's swan decoy. The decoy is hollow carved like the original and measures 5 ½ inches long. Reference for this example came from the book titled Southern Decoys of Virginia and the Carolinas by Henry A. Fleckenstein. This carving depicts a trapper's camp circa 1840. It includes a Hawken rifle (which is removable)--a beautiful piece of work in and of itself, three very intricate period traps, camp pots and pans, stick-a-light kit, plus many other extras. The carving at the above price comes with a protective plexi-glass cover and wooden base. This carving is highly detailed. 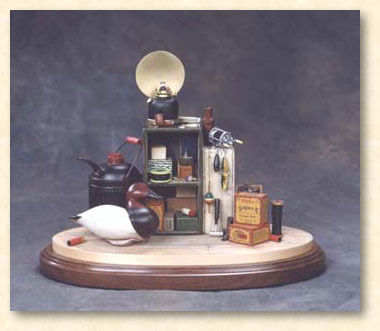 In the corner of the old sportsman's shed, this carving features a Lem Dudley canvasback decoy (removable), old lantern, fishing lures, bobbers, knife, matches, pipe, fishing reel, shotgun shell boxes, Hope's oil can, and various other items of hunting and fishing gear. 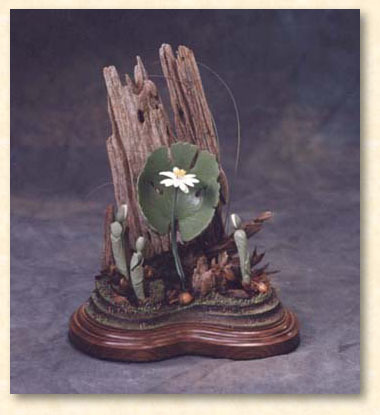 The miniature sculpture is carved in basswood and entirely hand painted. 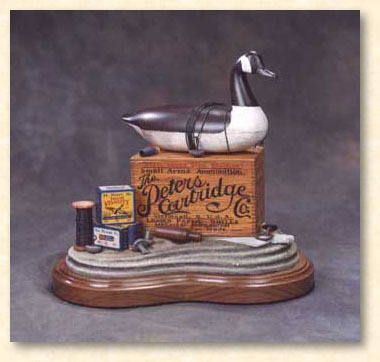 The miniature carving features a removable Charles Birch decoy, an old Peters Cartidge shot shell wooden crate, decoy anchors, Peters high Velocity individual shotgun shell boxes, call, and spent shotgun shells. The sculpture is carved from bass wood and everything is hand painted, including all the intricate box labeling and lettering. 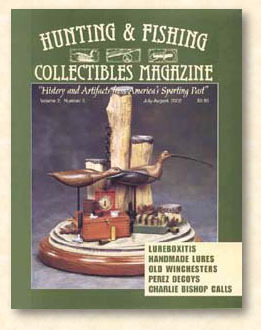 This carving was featured in a two-page article in the May-June 2002 issue of Hunting and Fishing Collectibles Magazine. The cottontail is heading for his hole in the ground. This carving has wispy tall blades of grass, just barely detectible in this photo. Minute detail in this piece includes miniature leaves in the ground cover. All carvings are mounted on a custom hardwood (walnut) base. A miniature carving of shore bird decoys in a seaside gunning setting. Thomas Gelston was a famous Long Island decoy carver in the late 1800's. Today his shorebird working decoys are considered some of the finest ever made and are a collector classic worth in the tens of thousands of dollars. They are part of our waterfowl history. 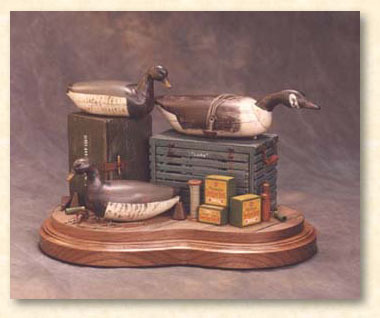 The miniature carving depicts these decoys in use as set up by some fictitious hunter. The carving includes a shooting box, brass shotgun shells, shot and powder, primers, reloading measure, peep whistle, and a shotgun shell extractor--all the accoutrements for a successful hunt. 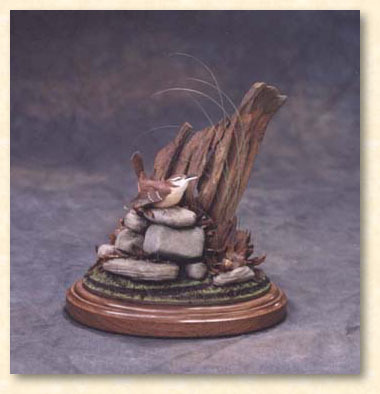 "Morning Song" depicts a Carolina Wren singing first thing in the morning. She is perched on a pile of old fence rocks at the corner of the property. There is an old stump in the background and the ground cover contains miniature leaves. In the foregraound there is an individual hand carved miniature acorn as an accent. There are tall grasses in the background to add an airiness to the sculpture. The setting is an old gunning shed on Cobb Island, Virginia, circa early 1900's. The Cobb family ran a very successfull sportman's clubhouse on Cobb Island from the 1800's to the early 1900's. This carving showcases some of their famous decoy carvings. The goose is removable for close inspection, but all the other elements are fastened in place. 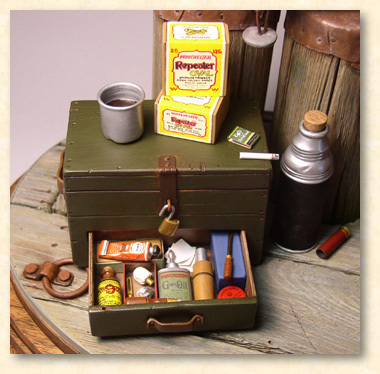 Details include 3 boxes of period Remington shotgun shells, decoy cordage, decoy anchors, spent shotgun shells, a call, and other small details. The blue-gray crate is for live decoys or tollers. 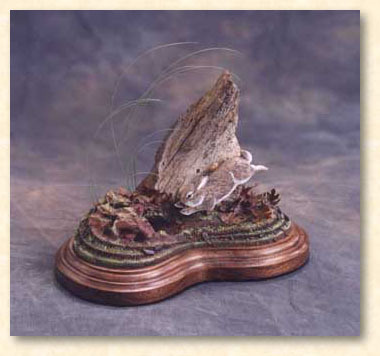 This carving was featured in the Nov.-Dec. 2002 issue of Hunting and Fishing Collectibles Magazine in a two-page article. The pale, lobed leaf embraces the stalk bearing the showy white 8 to 10 petaled flower. Found in rich woodland settings, this is one of the artist's favorite wildflowers, along with the Pink Lady's Slipper. This carving is packed with detail and depicts the early spring sprouting and blooming of this unique flower. The flowers and acorns are all carved from bass wood. The stem is metal. Other details include the ground cover leaves. 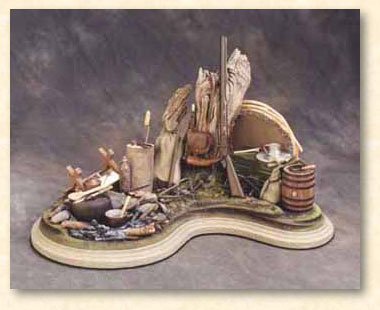 Just like the larger sporting carvings, the artist enjoys duplicating in miniature the flavor of real historical decoys. This swan has been a favorite at shows. 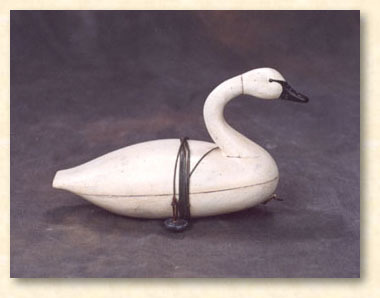 It is a representation of an Ira Hudson (of Chincoteague, Virginia, Circa 1940) style swan gunning decoy. Details include the anchor and anchor cord, the tie on, and the underside lead ballast. The miniature is skillfully antiqued as though the original has literally been shrunk in size. These are signed on the bottom by the artist.